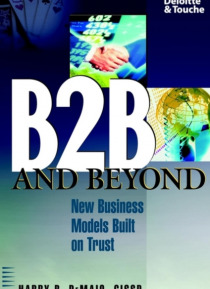 A groundbreaking guide to forging trusting, mutually beneficial B2B relationships Companies that have entered into B2B alliances may simultaneously be one and another's customers, suppliers, allies, and competitors. But in today's turbo-charged e-environment, how do companies take full advantage of the many benefits of B2B alliances while avoiding the obvious dangers of allowing potential competit… ors intimate access to their value chains? In this groundbreaking book Harry DeMaio, Director of Deloitte & Touche's renowned Enterprise Risk Service Practice, answers that question with the revolutionary concept of E-Trust, a proven strategy based on fostering business relationships based on mutual self-interest and trust. Writing for managers and corporate decision-makers, DeMaio explains the current state of B2B in an approachable, entertaining fashion, making difficult concepts easy to grasp. He demonstrates the critical role that trust, privacy, and security issues play in the B2B environment and provides guidance on how companies in various industries engaged in B2B relationships must address their varying security and privacy needs. Harry DeMaio (Cincinatti, OH) is Director of Deloitte & Touche's Enterprise Risk Service Practice.